Discussion in 'Star Wars Costumes and Props' started by _Lee_, Mar 21, 2006. 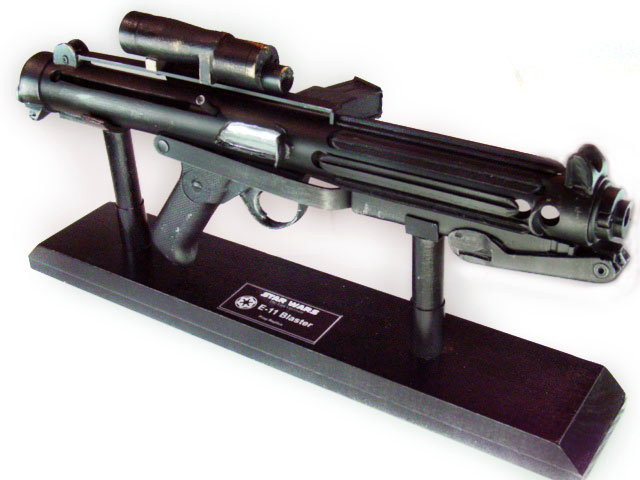 I recently purchase a resin Stormtrooper blaster and would like to display it in the best way possible.Does anyone have any ideas of where i could get a custom stand,or even dimensions to build one? You can use plexiglass/acrylic to cut stands and mount it on a display board. Cut a sqare out of the front stand to accomodate the stock. Cut a semi-circle out of the back stand to accomodate the barrel. You may also have to allow for a small square cut out for the stock clip in the middle of the semicircle. You could also make them out of wood or pvc/plastic tubing but then you'd have to paint it. The link in my signature will lead you to some tutorials for making them. You can use plexiglass/acrylic to cut stands and mount it on a display board.Â Cut a sqare out of the front stand to accomodate the stock.Â Cut a semi-circle out of the back stand to accomodate the barrel.Â You may also have to allow for a small square cut out for the stock clip in the middle of the semicircle.Â You could also make them out of wood or pvc/plastic tubing but then you'd have to paint it. Its made from scrap lumber, a dowel rod, some screws, and a few odd pieces.